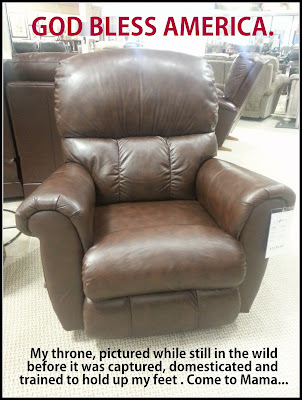 Cherdo on the Flipside: Behold, the Chair! For everyone who said they wanted to see my new chair that I raved about. I'm a woman of simple needs; add something shiney and I'll be amused all day. As chairs go, this is a fine specimen --with a pleasant, calm and supportive personality. What Geo said, and my apologies for missing the last Bonehead Blog Hop; promise I'll make the next one! You think it's your chair, but I'm sure Coco has other ideas. Prepare to paw wrestle her for it. Place your throne in a window with a southern exposure and you'll have sunny and chair. Coco is mad at me for getting her groomed (they nicked her tail!). If I can move it by the sea, I will. Nice throne and it appears a good place for a nap! It's totally approved for squid. And when you get old enough to start wearing adult diapers it can be your double throne. That's why I need the "leather package." You have to plan ahead. My aunt, a Pentecostal Free Will Baptist minister, passed away this week. Her maiden name was Bunker (as in the Bunker Hill gang). Ever since then, I see "Bunker" everywhere. Add this to the list. That is a great find, but beautiful and luxurious! It is soooo comfortable. I didn't realize how bad the other chair was for my carcass (it was only 2 years old!). My middle son is happy to take them off my hands. He's tall dude. It looks amazingly comfortable. It would take a shoehorn to get me out of it. I considered super gluing myself in there for a while. Cherdo, looks really comfortable, for sure! We have our TV mounted above the fireplace mantel in the new house, so sitting in the recliner with my feet up is the perfect angle. Happy Weekend! Your house is looking so great!! Have a good weekend, Linda! I love to plop down in a good recliner! Congratulations! I have two Lazy Boys that look like 1950's type Hawaiian arm chairs that recline. No sofa in the Library/TV room just the two chairs. just the best ! Get those feet up ! I rarely sit on our sofa. It's a big leather thing that #3 son loves to plop down on, though. He has total squatter's rights on it. Nice! It looks like the one I'm sitting in now in our bonus room. The previous owner of the house left it because they were downsizing, so SCORE! I bought one of those "chair and a half" chairs to work in. It's in my sunroom and, this may sound sad, but I bought it because my dog can sleep next to me when I write! While we were shopping, I saw one of those "chair and a half" things and I thought about it for a minute...Coco would be totally into that. That looks amazing. Meanwhile, this is my throne. We gotta take our thrones where we can get them, when we can get them. ...and I'm glad I'm not the only one who gets the "double post." If I knew why it happened, I'd stop...but I haven't a clue. That's a throne fit for a queen. Ship it to me now. Janie, Her Majesty The Queen of Grammar.